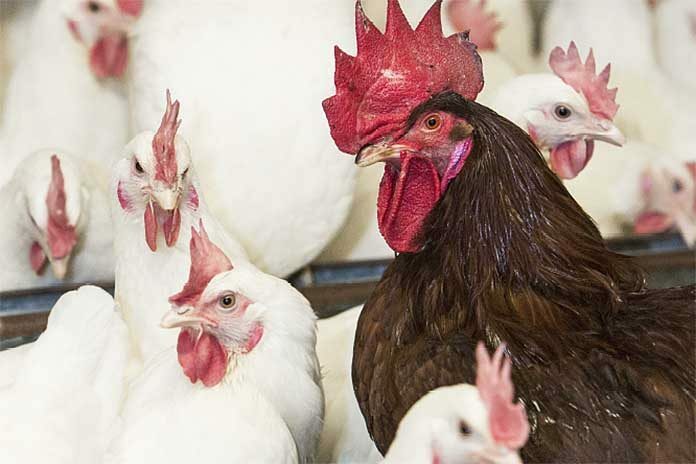 Infectious bronchitis virus (IBV) causes a highly contagious upper-respiratory tract disease in chickens and some strains are nephropathogenic. 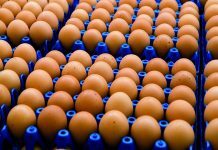 The virus can also cause significant egg production losses and mortality in commercial layers and breeders. Three broiler companies in Colombia with several broiler flocks and five breeder flocks presenting overt respiratory signs, nephritis lesions, late mortality, decreased egg production and decreased fertile egg quality were investigated for IBV infection. Results from ELISA serology and a molecular diagnostic survey confirmed that flocks had been infected by either one or concomitantly by more than one of the IBV variant strains. Details of the clinical and diagnostic investigation and control attempts are here discussed. Infectious bronchitis (IB) is possibly the most economically important viral respiratory disease of chickens in regions where there is no highly pathogenic avian influenza virus or velogenic Newcastle disease (vND) virus and is found everywhere that broilers are commercially produced. Even in some countries endemic for vND (e.g., Peru and Colombia), IB is regarded as having a similar or even higher economic impact to vND. 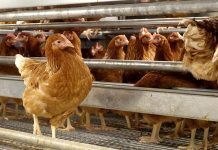 The virus can also cause significant egg production losses and mortality in commercial layers and breeders. Coronaviruses, particularly IBV, are RNA viruses that present high genetic mutation rates. When those mutations occur in the spike gene they can result in the emergence of antigenic variant strain viruses or new serotypes. These variant strains are often partially or not controlled at all by live and inactivated IBV Massachusetts strains-based vaccines. During approximately the last eleven years, several countries in Latin America have reported an increasing incidence of clinical and subclinical outbreaks of IB caused by variant strains of the IBV. d) PRT/L 898/04 original molecular detection in swabs taken from industrial poultry in Portugal. All molecular detections and genetic characterizations were carried out at the poultry diseases diagnostic laboratory GD Animal Health (Deventer, Holland). Samples comprised tissue imprints from trachea, lungs, kidneys and cecal tonsils from clinically affected birds on FTA card (GE Healthcare Bio-Sciences Corporation, Piscataway, NJ, USA). The FTA card material was processed for IBV molecular detection (RT-PCR) and sequencing of PCR products as described elsewhere. In short, nine sample discs from the dried spot on each of the four FTA card circles were collected using a 2.0 mm diameter Harris micro punch and placed in a 1.5 mL tube. 270 µL of RNA Rapid Extraction solution (Ambion) was added to the tube and incubated for 5minutes after mixing. Subsequently 200 µL of solution for RNA extraction (MagMAX system) was added. The RT-PCR was then performed. A fragment of about 350 base pairs of the S1 gene was amplified with the primers XCE1+ and XCE3–. The S1 amplicons were separated on a 1% agarose gel, and visualized with ethidium bromide staining and an ultraviolet light transilluminator. The purified amplicon was sequenced (BaseClear, Leiden, The Netherlands) using both XC1+ and XCE3– primers. The sequence data were aligned using computer software (Bioedit, Ibis Biosciences, Carlsbad, USA). Broiler flock sampling and sample submission for molecular diagnostics were carried out on different occasions. Likewise, the detection of strains Q1, YE/L and PT/L in company A was performed in five different breeder flocks sampled at different ages and on different sampling dates and samples were submitted to the laboratory on different occasions. When used, IBV serology was carried out locally (laboratories in Colombia) in commercial ELISA kits (Idexx® IBV Ab Test, Idexx® laboratories, Westbrook, Maine, USA). For the flocks suspected of undergoing an Infectious Bronchitis outbreak clinical signs, macroscopic lesions and flock clinical and productivity data were collected when appropriate or possible. Table 1 presents the variant IBV strains diagnosed in the three poultry companies in Colombia. 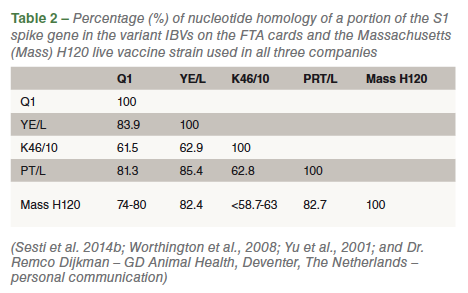 Four different IBV variant strains were detected (Q1, YE/L, K46/10 and PT/L). The diagnosis of the Q1 and K46/10 strains was carried out in few broiler flocks in companies B and C, respectively. Percentage nucleotide homology of the detected partial portion of the S1 spike gene in the variant IBVs on the FTA cards when compared with the originally GenBank-deposited sequences were 96.7-98% for the Q1 (accession numbers: AF286302 = original Q1 and HM446006 = Q1 from Chile), 96.3 % for YE/L (accession number = EF006524), 97% for the K46/L (accession number = JF804679) and 93% for the PRT/L strain (accession number = EF066521). Further genetic comparison of the variant IBVs detected with the only IBV live vaccine strain (Massachusetts H120) available in Colombia indicated a quite small S1 protein gene homology between them (Table 2). ELISA serology titers at slaughter in broiler flocks affected with the Q1 strain were quite high at company C (maximum titer as high as 6000 and GMTs around 2500; vaccination scheme = 1 dose H120 spray at day one and one dose of Ma5 spray between 2-3 weeks of age) similar to what has been reported elsewhere (Wang et al., 2000). For company B, infected with the K46/10 strain, IB titers were at medium to normal levels (maximum GMT = 2769; vaccination scheme = 1 dose H120 spray at day one; average slaughter age = 36 days). In all investigated flocks, serology for other respiratory diseases (e.g., Newcastle, Metapneumovirus infection) was not indicative of field infection. 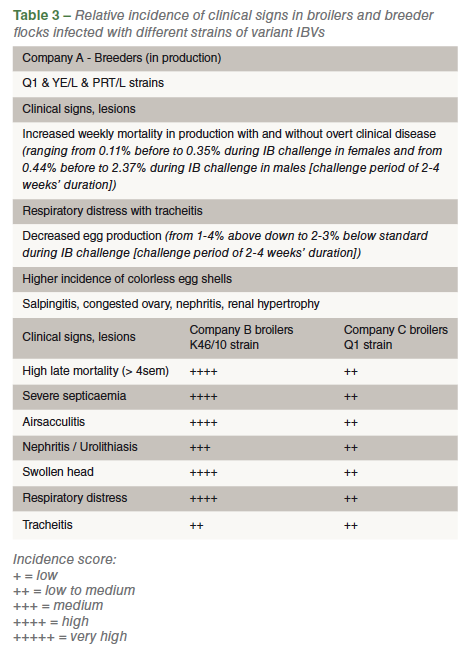 Clinical signs in broilers were quite diverse in Companies B and C and a more severe incidence of clinical disease was observed in those flocks infected by the K46/10 strain (Table 3). Late mortality (>4 weeks of age), renal and respiratory signs as well as septicemia due to secondary bacterial infection were quite common in affected flocks. In Company B, affected by the K46/10 strain, many infected flocks presented average mortality of up to 15% at slaughter age, mostly occurring during the last two weeks of the grow out period (6th – 5th week). The five breeder flocks investigated in Company A were all clinically affected in a similar manner (Table 3). The severity of clinical signs varied from flock to flock but they were always present and easily identifiable. Flocks with infection diagnosed by either the Q1 or the YE/L or the PRT/L strain presented clinical disease at the ages of 27, 28, 30, 44 and 65 weeks (Table 1). This is quite an unusual report of clinical infections caused by multistrain variant IBVs occurring simultaneously in a given country in Latin America. The Q1 strain has been causing severe losses to the broiler industry of several South American countries, including Colombia, during the last years. For the first time in Latin America the Q1 strain was not only detected but also correlated with clinical disease in a breeder flock. In addition, three other variant strains never previously reported in Latin America (K46/10, YE/L and PRT/L) were also detected and correlated with clinical disease and macroscopic lesions in broilers and breeders. Company A, where Q1 and YE/L and PRT/L variant strains were detected, has seen recurrent clinical outbreaks in their breeder flocks, particularly during the first 15-20 weeks of production although, in the present investigation, a 65-week flock was also clinically affected by the YE/L strain. Of particular clinical severity (Table 3 for main clinical signs and lesions) was the infection of two young breeder flocks (27 and 28 weeks of age) by the strain PRT/L. The general perception in the company is that this clinical situation of IBV infection in breeders has been increasing in severity during the last several months despite each flock being vaccinated with four live and four inactivated doses of IB vaccines during the rearing period (Mass strains only). Live Mass revaccination during production seems to slightly alleviate the clinical condition but never completely prevent or control it. 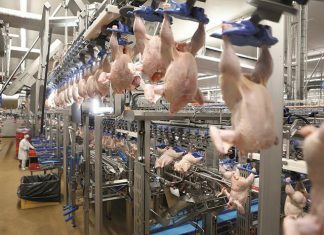 A very similar situation is occurring in broilers in Companies B and C which have had their broilers flocks challenged by the K46/10 and Q1 strains, respectively. During July 2015, an epidemiologically critical period in Company B, mortality of K46/10 affected broiler flocks averaged 14%. These broilers were vaccinated via spray at day one with only the H120 strain. Company efforts to improve biosecurity and decrease environmental contamination as well as measures taken to reduce the vertical transmission of mycoplasma to the broiler progeny have considerably improved the IBV epidemiological situation in the company. Accordingly, by the end of 2015 the clinical situation had almost returned to normal on the broiler farms with total mortality decreasing to an average of 5.5%. Clinical IB outbreaks in broilers caused by the Q1 strain in Company C are not new for this production system since the Q1 strain has been diagnosed in the company in the past. Since the first diagnosis the company has been vaccinating broilers against IB at day one and in the field (2-3 weeks of age) using two commercial Mass vaccine strains (H120 and Ma5). Nonetheless, the vaccination program has never been totally effective at controlling the Q1 strain. The same situation has been seen in recent years in Chile, Argentina and Peru. Total control of the Q1 strain, at the level of both controlled protectotype trials and in the field, has only been accomplished when broilers were vaccinated with a combination of a Mass vaccine strain with a 793/B-type vaccine strain. Such a vaccination program cannot be used in Colombia at the moment as no 793/B-type live vaccine is registered in the country. As for the K46/10 and YE/L strains, there is no published information from protectotype trials indicating that protection against these strains would be afforded by the Mass H120 strain alone or in combination with a 793/B-type live vaccine. Based on the S1 gene nucleotide homology between the K46/10, YE/L and PRT/L strains with the Mass H120 strain (depicted in Table 2), it seems likely that the protection afforded by the Mass strains alone will be quite low against these new variants circulating in the country as it is against the Q1 strain. Several years ago, Alvarado et al. (2005; 2012) were able to carry out the first molecular detection of four unique IBV genotype variants in Colombia although no subsequent work (pathotype and protectotype trials) has been done with those indigenous genotypes which were isolated from commercial layers and broilers. At the moment, there is no epidemiological evidence or clues as to where from and how these IBV variants were able to arrive in Colombia and establish a new and quite economically damaging clinical picture in broiler and breeder flocks of three different poultry companies. The same question has often occurred in many parts of the world after the appearance of new IBV variants that are genetically very similar to strains originally isolated and detected on another continent several thousands of kilometers away. Such an unusual IB epidemiological situation in Colombia should be thoroughly investigated and the extent of the dissemination of the four IBV variants in the Colombian poultry industry should be clearly and quickly determined. In addition, the K46/10, YE/L and PRT/L strains should be isolated, pathotyped, with protectotype trials carried out, and eventually, new and effective vaccination programs made available for the Colombian poultry industry.